PALMER — Soldotna extended its reign atop the Alaska Division II football world on a rainy Saturday at Machetanz Field. 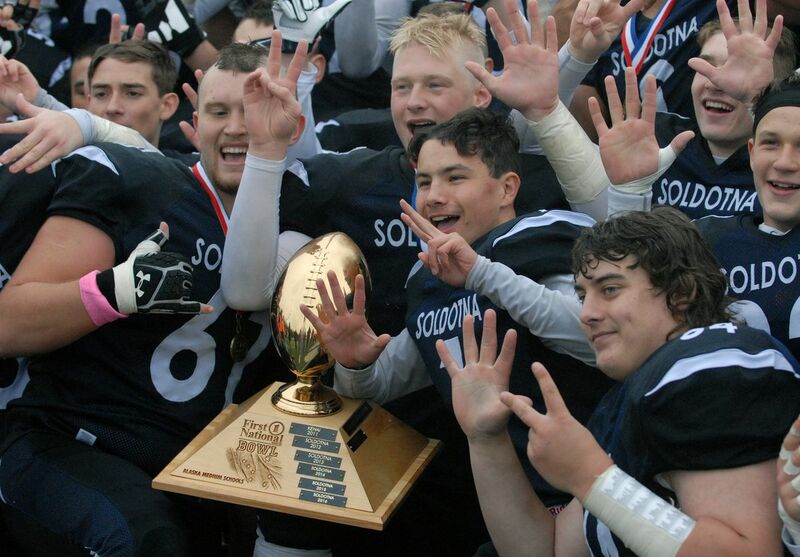 The Stars won their seventh straight state title in typical SoHi style, rolling up 285 rushing yards in a 46-14 romp over Eagle River in the ASAA/First National Bowl Division II State Championship. The victory was the 11th championship for the school and the 10th in 12 seasons for head coach Galen Brantley Jr.
"Never," Brantley said during the postgame trophy presentation. 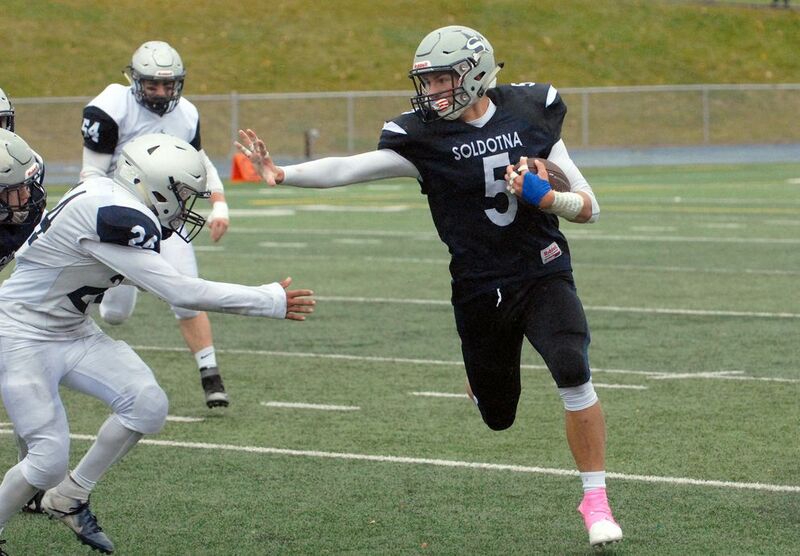 The Stars won their ninth straight game since a season-opening loss to Division I West, which snapped Soldotna's 59-game, state-record winning streak. Eagle River put up brief resistance in its first title game, getting a 48-yard touchdown pass from Ryan Adkins to Mason Piper midway through the first quarter to take an 8-6 lead. But it was all Soldotna after that. The Stars took the lead on a 24-yard strike from Jersey Truesdell to Galen Brantley III, then extended the gap to 19-7 on Aaron Faletoi's second rushing touchdown of the half. The Stars piled it on in the second half, getting rushing touchdowns from Cy Updike, Hudson Metcalf and Wyatt Medcoff as well as a 9-yard touchdown pass from Tyler Johnson to Dennis Taylor. "Soldotna's a really good team," Adkins said of the Stars, who averaged 53.3 points per game this season. Adkins said he was proud of Eagle River's historic run, which saw the Wolves post their best record in school history, defeat Chugiak for the first time and make their first playoff appearance. But the senior admitted he wanted more in his final game in navy and silver. "We met a lot of goals, but we didn't meet this one," he said. Medcoff led a balanced Soldotna attack with 100 yards on 14 carries. Faletoi added 64 yards, Truesdell chipped in 61 and Metcalf had 51 in a game played in heavy rain that let up by the fourth quarter. Even though state titles are old hat for coach Brantley, he said every championship run has been special in its own way. "Every single year it's a different group of kids and a new challenge," he said. Brantley beamed as he watched his players celebrate. "There's nothing else I'd rather be doing."